A study for a modern steel house - a new prefab entry. This is a facade study for a house design that I am currently engaged in. 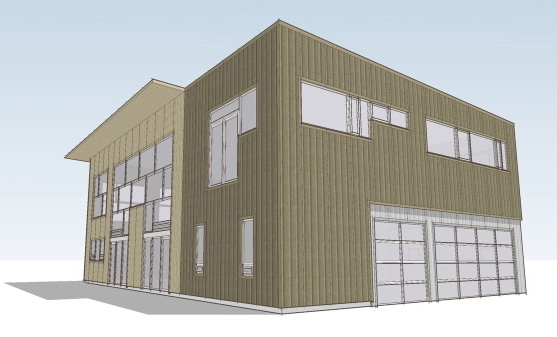 It is a large four bedroom house with two master bedrooms that I am working on as a design consultant to Northern Steel, a international metal building manufacturer. The prototype will be built this winter and could be in production immediately afterwards. The house will be built using their >EcoSteel system. They have encouraged me to post more information about the system so I have revised this blog entry. Northern Steel has taken the initiative to adapt metal building conventions to residential design. Their "EcoSteel" system as it is called leverages standard metal building construction for use in the relatively light residential construction setting. This allows them to extend the efficiency that is practiced in this kind of commercial construction. I am collaborating with Northern to develop modern designs utilizing the EcoSteel system as we all agree that it is a natural for the given construction aesthetic of the system. We don't have all the details yet as we are still working through this. Browse through the rest of the site and I think you will get a feeling for their business. I think this is a unique entry into this modern prefab movement. They already prefabricate and erect metal buildings nationwide so there is no warm-up period. Everything is in place and it should scale up immediately as demand warrants. I am interested in your feedback however and I can direct interested parties to the manufacturer. This list is not shared or sold. a catch all for inspiration, things to remember, ideas to return to..
blogs are back up and running!